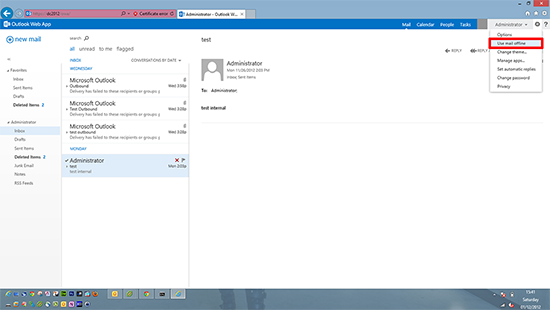 A great new feature of OWA 2013 is the ability to run in ‘Offline mode’. This runs in the same manner as Microsoft Outlook’s ‘Cached Mode’ which has been built into full Outlook since version 2003. 2. 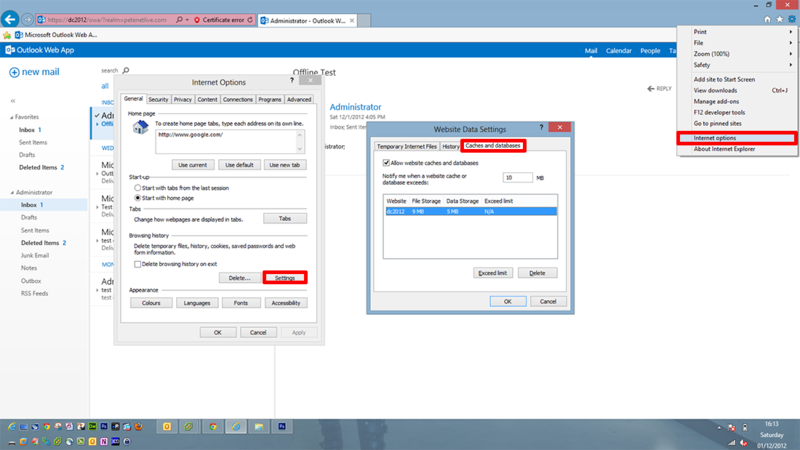 You have to be connecting to OWA being hosted on an Exchange 2013 CAS server. 3. 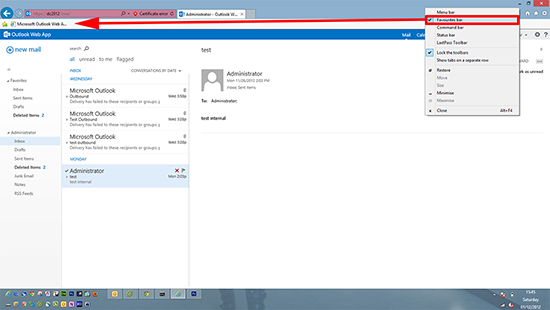 Your mailbox needs to be hosted on an Exchange 2013 Mailbox server. 1. While you are in offline mode, you can open OWA, read and reply to emails, send new emails, respond to meeting requests, view your calendar, view and edit your contacts. Note: Obviously all sent and updated data will not be sent to recipients, or changes reflected in Exchange until you are no longer in offline mode. 2. The system will only cache data for the past month and calendar entries for the next twelve months. 3. Contact information for recently used recipients will also be cached. 1. A prolonged period in cached mode can cause scheduled events in your calendar to stop working. (Its only designed for users to be sporadically disconnected). 2. You cannot access Archived folders. 3. With the exception of the Inbox, Sent Items, Calendar, and Drafts items folder, only folders you have accessed will be cached. 1. Whilst online and connected to OWA > Settings > Use mail offline. 2. For security reasons you will be asked if you are on a public computer > Prompted to add the URL to favorites (or bookmarks depending on the browser). 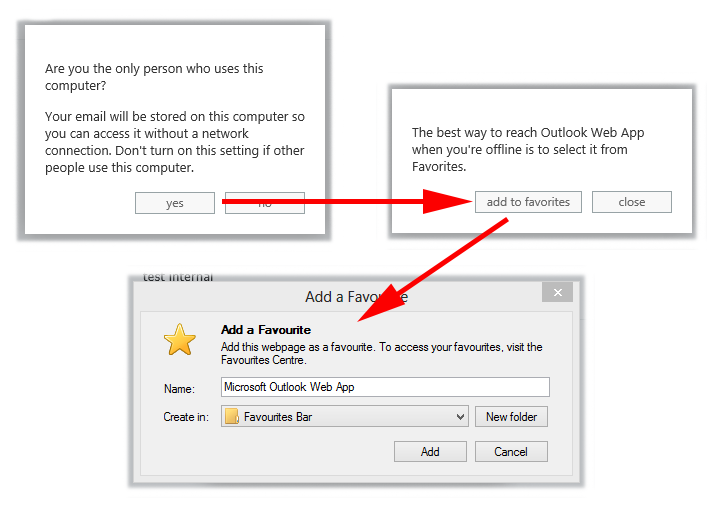 Note: DO NOT use this feature on a shared or public computer, the cache is accessible from other user accounts on the machine. 3. In this example I’m using IE10 > Just for ease I’m enabling the Favorites bar to see the shortcut. 4. Depending on the size of the mailbox and speed of connection, it may take a while to syncronise. Whilst offline OWA will display the time it last connected to Exchange, and while you are working offline if you send any mail it will keep a track of pending options for next time you are online. The whole system works because the supported browsers have the ability to cache information locally, to see where that’s being set in IE10, Internet Options > General > Browsing Data > Settings > Caches and Databases.